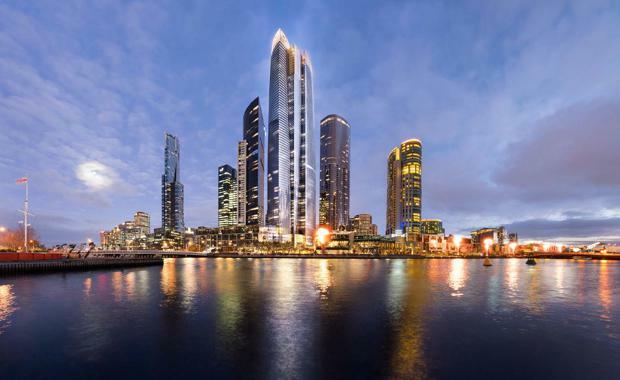 Crown Resorts and joint venture partner Schiavello Group have selected a new architecture firm to design what will be Melbourne's second tallest building. The companies have selected WilkinsonEyre as the winner of a global competition to design the Queensbridge Hotel Tower in Southbank. The joint venture is planning to build a 317m high skyscraper on the site, which was purchased for $30 million last year. It will be the second tallest building in the city behind Australia 108, also located in Southbank. The new planning application featuring WilkinsonEyre's design has not yet been lodged. However, new images released by WilkinsonEyre reveal that its solution for the Queensbridge Hotel Tower will be created by three interlocking sculptural forms providing a striking addition to the Melbourne skyline. “We are confident that the design of the proposed Hotel and the ’one of a kind’ offerings like the ’Sky Bar’ at the top of the tower will be ‘must see’ destinations in Melbourne." The proposed Queensbridge Hotel Tower will comprise a 388room, luxury six–star hotel and approximately 680 apartments. The hotel will feature an event space and a publicly accessible restaurant, lounge and garden terrace at the top of the tower. The design also provides an active streetscape and public forecourt area with retail outlets and restaurants, which will become a new amenity for locals and visitors, connecting the ground floor of the building and hotel to the outdoors area. In addition to the proposed landmark hotel tower, Crown and Schiavello are also proposing a major upgrade to Queensbridge Square improving the precinct’s attractiveness for local residents and visitors alike.